Two Tickets For...: It's a Disney Movie, So Of Course We Cried: Our Review of "The Odd Life of Timothy Green"
It's a Disney Movie, So Of Course We Cried: Our Review of "The Odd Life of Timothy Green"
Synopsis: When Jim and Cindy Green (Edgerton and Garner) are told they can't bear their own children, they bury a box full of their slips of paper containing descriptions of what their perfect child would be like. Magically, overnight, a 10-year-old boy named Timothy sprouts into their life just as they described him, and he goes on to positively effect not only them but their entire town. Andrew: Hello readers! So we know it's been a little slow lately but it's for good reason. I'm currently out-of-state working on the Little League World Series in Pennsylvania while Sarah is still back in Connecticut. So my schedule's pretty busy AND we're not able to see movies together until I return on August 26th. 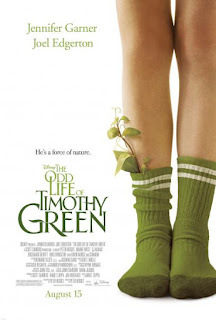 That said, while we can't see any movies together right now, we were each able to catch this week's first new release, Disney's The Odd Life of Timothy Green, starring Jennifer Garner and Joel Edgerton. Sarah, we're probably not going to be able to do a full preview this week, but we've seen the trailer for this film about a hundred times and I know I personally have been looking forward to it just to see what it's really about. Also, I'm a fan of Edgerton's after his turn in Warrior. What about you? Sarah: The only reason I wanted to see this movie was to see how Edgerton did in it. I really didn't care all that much about what the story was actually about. But I was pleasantly surprised! This was actually a pretty cute movie and I really enjoyed Garner's performance too! She's not typically my favorite actor but she was good in this. I also really liked CJ Adams (Timothy Green). He had such expressive eyes and did well for a newbie. Now on to the story. What did you think about Timothy and his life with the Greens? A: Whoa whoa, hold on, I want to say that I totally agree with you on the performances by the three leads. I thought Edgerton, Garner and Adams all did a phenomenal job. I particularly think Garner and Edgerton did a fantastic job of portraying a couple that is devastated by the realization that they'll never be able to have a baby of their own flesh and blood. They killed me early on. (I know, I'm a softie. I blame the whole marriage thing just like Sarah does.) And Adams was darn good as Timothy. He was just so bubbly and bright, it was perfect for his character. So now to answer your question: I enjoyed many aspects of Timothy and his life with the Greens. A lot of it is schmaltzy stuff, maybe a little too saccharine at times, but it all felt very organic. A lot of what happened on screen had me smiling and rooting for them (internally, don't worry, Sarah). Your thoughts on the Green's story? S: I liked the Green's story. Like you said, it was very organic for the three of them. When they are excited or hurt, it didn't seemed forced, which it EASILY could have. But outside their nuclear unit, I would say that they organic feel stopped there. The Greens live in this small town, USA, that is famous for making pencils. I felt like, besides the Greens, the rest of the people in this town were just awful human beings! Solid performances all around by the leads in The Odd Life of Timothy Green, and even though scenes like these are cheesy as all get-out, somehow it works. The whole town is going through a problem; the factory that makes the pencils is possibly going to shut down. This puts a lot of stress on all the people. But they don't have to be SO negative. I don't know, I thought it seemed a little too much at times. A: No I'm 100% with you on that! It was almost like everyone else in the town was a stock character that they hired recognizable actors to play so we didn't hate them SO much. But yeah, Ron Livingston (Office Space) as Jim's boss is a believable jerk, Rosemarie DeWitt (The Watch) as Cindy's sister is a rhymes-with-witch, and Common as Timothy's soccer coach is the worst coach I've seen in film in a while. But at the same time it helped increase the joy you feel for the Greens when they can be happy about their successes. Another thing that bugged me was how fake the CGI leaves on Timothy's legs looked. It was real bad at times. It was even worse when they made them CGI when they WEREN'T on his legs and he was just holding one. Why not just have him hold a real leaf? S: I agree with you on the leaves. It didn't bother me as much but still, it was a little annoying. I get that the focus in on the Greens but I just don't see how so many people could be so negative. Now, this movie begins with the Greens in an adoption agency and the Greens talking to the social workers. They are telling "their story" about Timothy. Right off the bat, you know that this movie is not going to end with Timothy in the picture. Even with that, I was actually really touched by the way they wrapped up the story. I actually welled up with tears as well! A: I was pleasantly surprised by the story-telling device they used with the flashbacks. While those adoption agency scenes were maybe the weakest parts of the film because I did not like Shoreh Aghdashloo's (House of Sand & Fog) performance as the adoption agency worker, I was not expecting the story to unfold that way. And yes, the whole thing ends in a way that brought a couple tears to my eyes, and in a good way. Again, it's schmaltzy, but dang it I didn't care. I ended up caring about the characters and it got to me. I think that's a testament to the performances and story-telling by co-writer/director Peter Hedges, who has some good experience with movies that hit you emotionally. He wrote both the novel and screenplay for What's Eating Gilbert Grape?, he wrote the screenplay for About a Boy, and he directed Dan in Real Life (which is an underrated film, in my opinion). S: I think this is a cute movie. Will we own it? Probably not. Is it a fun one to see with the family that both the kids and parents will enjoy? Absolutely. FINAL VERDICT: A nice way to spend a Saturday afternoon! Good review. This movie didn't do much to make me feel emotional towards the whole story, but at least it entertained me with the performances on-display. Mainly Edgerton, who is proving to be a great, new leading man. I know the very end hit us close to home because it reminded us of Sarah's younger sister and her family. 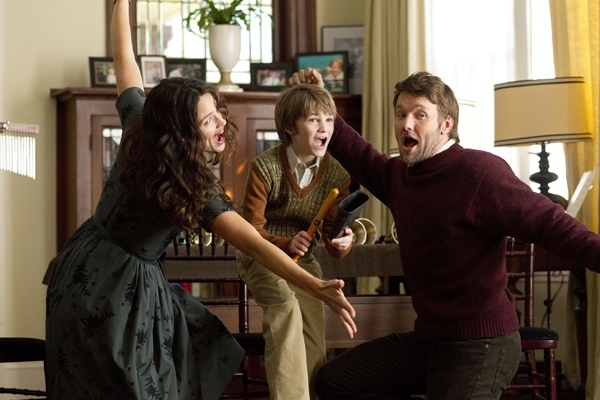 But yes, Edgerton is quickly becoming one of our favorites. He was fantastic in Warrior, and was one of the only redeeming qualities of The Thing remake/reboot. Personally we're looking forward to seeing him more in The Great Gatsby, Zero Dark Thirty and we still need to go back and watch Animal Kingdom.